Mountain Lion is a special type of software on your MacBook called an operating system (or OS, as in OS X). That means that Mountain Lion essentially runs your MacBook and also allows you to run all your other applications, such as iTunes or Photoshop. It’s the most important computer application — or software — that you run. Think of a pyramid, with Mountain Lion as the foundation and other applications running on top. The Mountain Lion desktop isn’t made of wood, and you can’t stick your gum underneath. However, this particular desktop does indeed work much like the surface of a traditional desk. You can store things there, organize things into folders, and take care of important tasks such as writing and drawing. Heck, you even have a clock and a trash can. The Dock is a versatile combination: one part organizer, one part application launcher, and one part system monitor. From the Dock, you can launch applications, see what’s running, and display or hide the windows shown by your applications. It can disappear until you move your mouse pointer to the edge to call it forth. The menu bar isn’t found in a restaurant. You find it at the top of the desktop, where you can use it to control your applications. Virtually every application that you run on your laptop has a menu bar. The Apple menu (which is identified with that jaunty Apple Corporation icon). The Application menu (which always bears the name of the active application). 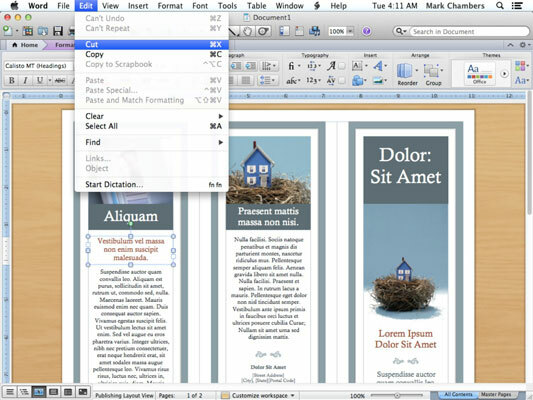 For instance, the DVD Player menu group appears when you run the Mountain Lion DVD Player, and the Word menu appears when you launch Microsoft Word. 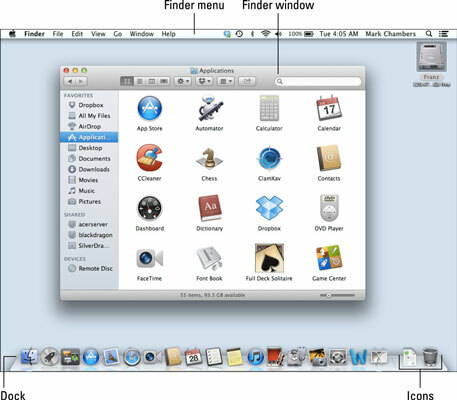 Mountain Lion gives you access to the applications, documents, and folders on your system in the Finder Window.